Business Sense – Pay your Bills on Time! Cash flow issues often initiate a necessity to pay bills late, including federal and state taxes. Consider some sage business advice concerning on-time payment. Paying on time makes sense – paying late just puts off the inevitable payment, and can cost you your credibility. Paying late does not save you money it normally costs more money – if you can pay early, you save cash so try asking for deeper discounts from your vendors with early payment. Ensure excellent future service – everyone forms judgments about the businesses they come into contact with, but the biggest black mark is more than likely when payment is late, or not forthcoming at all. Beth Laurence gives a great example: “You want to be a company that other companies want to do business with. For example, if your business suddenly needs to ask a print shop to turn around a flyer in a few hours, you'll have a much better chance of getting them to say yes if you paid your last bill the day it was due.” These businesses with which you do business will be the first to recommend you if they feel you are reliable. If it is possible to maintain a positive credit profile, it will always be excellent for business. Sometimes the intentions are there, but your customers can be the reason for your credit slip if they are also paying late. So while positive credit is recommended, if you find your company slipping due to late payment from your customers, it may be worth considering factoring your accounts receivables. Invoice factoring is a fast and efficient financing option allowing you receive money now for outstanding invoices due to be paid later. The good news is that it is not your credit that is important, it is the credit history of your customers. If you can use invoice factoring to ensure you cover all your operational costs, you will be going a long way towards improving your credit score, so you are not turned down for office space, by suppliers, or wholesalers, or even for a loan at the bank. Beth Laurence finishes her article with some prudent advice; if you have to pay late, make sure you communicate! Partial payments are better than no payment at all. 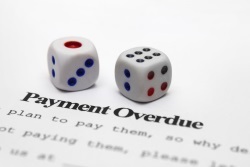 Be positive with your creditors about the reason for late payment so they don’t assume you will never be able to pay. You do not want to get into a situation where they presume your company is in such dire straits that they cut off any future credit. She also advises that on-time payment can provide an excellent cushion for those times when late payment is your only choice. If suppliers have trusted you throughout the years, they will be more inclined to work with you to find a solution. Again, communication is key.